Aquatic rotula is native to India, branching, under shrub usually grows up to 2 m tall with numerous short lateral arrested branchlets often rooting, aromatic, pinkish and glabrous, mostly found in the rocky riverbeds. Leaves are arranged alternately, or clusters, oblong to obovate or linear-oblong, entire or shallowly toothed, glabrescent or sparsed scabrous, ciliate along the margins, cuneate at base, obtuse or shortly apiculate at apex; petioles 0.3 cm long, greenish, sized up to 2 cm long and 0.5 cm wide, oblong, obtuse. Flowers pink or purplish, solitary in terminal or axillary branches, in few-flowered racemes. Stamens 5, exserted at the base of the corolla tube, with filaments up to 0.3 cm long and oblong-ovate anthers almost 0.2 cm in length. Fruits are subglobose, orange-red drupes. Seeds oblong, albuminous. 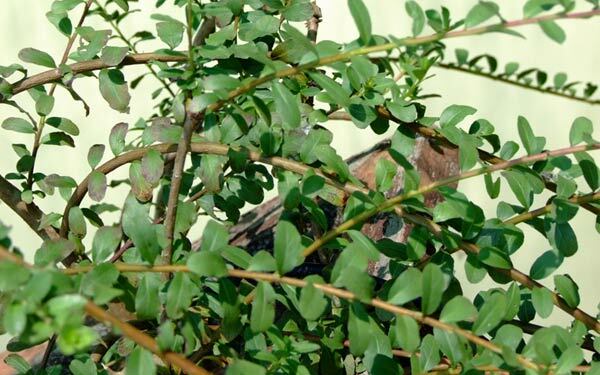 It is used in traditional medicine for kidney and bladder stones, the root of the plant tubers are useful in treating coughs, fever, poisonings heart diseases, blood disorders, ulcers. Flavonoids, Alkaloids, Phenolic compounds, Amino acid, Proteins etc. The roots are bitter, astringent, cooling, diuretic, antirheumatic and laxative. The root decoction is useful in the treatment of bladder stones and sexually transmitted ailments.